This South-Indian Prawn Cakes are inspired by the cuisine of Goa. These little cakes are the perfect Indian snack. In this recipe we unite the Goa typical flavors of garlic, chili coriander and mint. When you serve this little threads with fresh lime juice you get the best South Indian flavor. This cakes are a perfect Indian snack für your next party or even a delicious side dish for another Indian meal. First you have to transfer all ingerdients into a kitchen machine. Puree everything into a grainy paste. Now transfer mixture into a bowl and cover it. Leave in the fridge for at least 6-8 hours. Over night is perfect. Now heat oven on 200 °C and place a baking sheet on a griddle. Use your wet hands to make 20 small balls with a diameter of 4 cm out of the mixture. Now you place it on the griddle and dab the fish balls with some oil. Bake the little fish cakes for 15-20 minutes until they have a brown color and pop up. 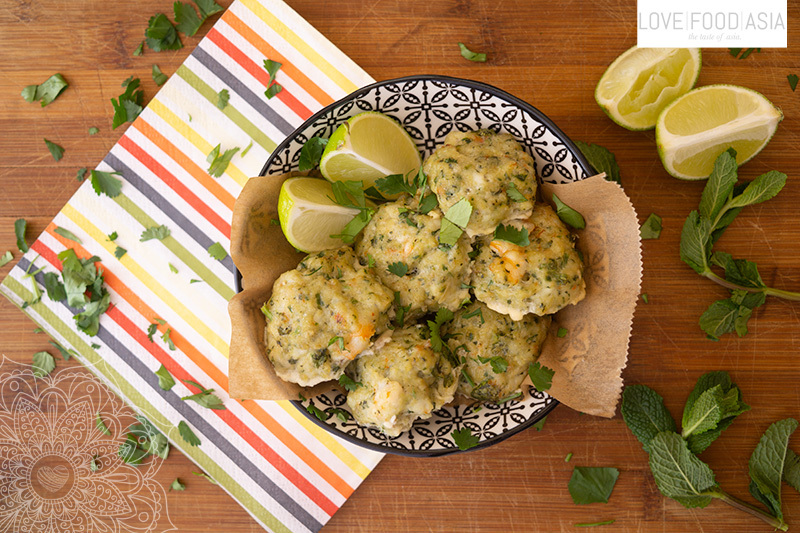 At the end you serve the warm prawn cakes with fresh lime wedges.